Which of the two stocks described below would you rather have owned? This company went public 20 years ago. For most of its public life, the company has been “investing for growth,” otherwise known as generating losses. On 199 occasions, the shares have had daily declines of 6% or more. Over three-day spans, the stock has fallen 15% or more 107 times. Over longer time horizons, the damage has been worse. In 16 out of its 20 years on the public markets, it has suffered 20% declines. On half of those occasions, the drawdown was greater than 40%. When the tech bubble burst, the stock plummeted, losing 95% of its value between December 1999 and October 2001. Just seven years later, during the depth of the financial crisis, the stock plunged a further 64%. The volatility has been gut-wrenching. Set forth below is a chart that shows the steepest drawdown by year, for each of the last 20 calendar years. This company also went public 20 years ago. At the time of its IPO, the company was three years old and had a market capitalization of $660 million. On a split-adjusted basis, the share price has since increased from under $2 to $1,000—a compounded annual gain of 36%. A $10,000 investment in the company at the time of its IPO would be worth $4.9 million today, a 49,000% return—and 155 times greater than a comparable investment in the S&P 500, including dividends. With a $480 billion market capitalization, it’s now the fourth largest company in the S&P 500. But there’s much more to this story, with important implications for individual investors. According to research from Arizona State University finance professor Hendrik Bessembinder, and as reported in The Wall Street Journal, “From 1926 through 2015, only 30 stocks accounted for one-third of the cumulative wealth generated by the entire U.S. stock market.” Amazon was one of those 30. To put that 30-stock number in perspective, there were 25,782 publicly traded companies over that period. Only 0.33% of all public companies over the last nine decades accounted for half of the return generated for investors. Fewer than 1.1% of all stocks that existed during this time frame were responsible for three-quarters of the stock market’s cumulative dollar gains (as measured relative to returns on cash). The top 1,000 performing stocks—fewer than 4% of the 25,000+ total during this period—accounted for all the market’s gains. Putting your money in one-month U.S. Treasury bills would have matched the combined returns of the other 96% of stocks. 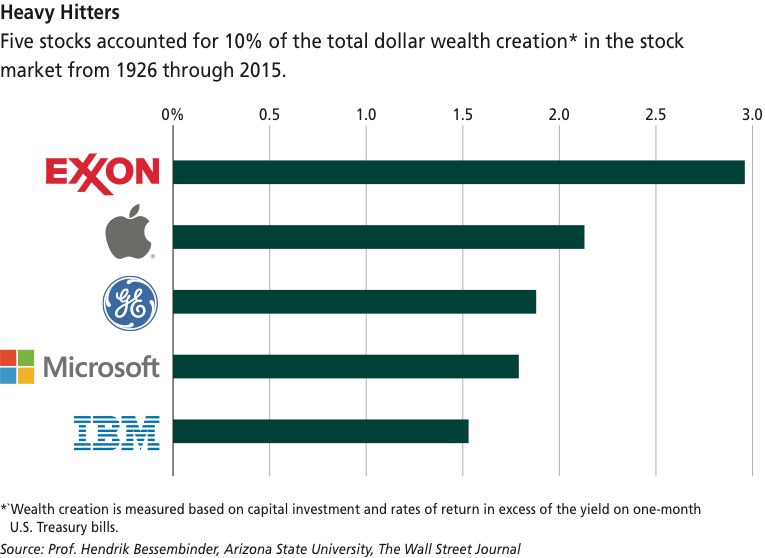 As the chart below illustrates, just five stocks accounted for 10% of the total dollar wealth creation in the stock market from 1926 through 2015. Based on this data, we can clearly see that the average return of the stock market and the return of the average stock are two totally different concepts. We can also conclude that the odds of finding the next superstock—another Amazon—are exceedingly slim. And even if one had the investing acumen at the time of Amazon’s IPO to identify it as the investment monster it would become, what’s the chance that same investor would have had the intestinal fortitude to ride out the stomach-churning declines of the ensuing two decades? Therein lies the great challenge of stock picking: First, one has to identify a potential winner. Then, one also must have the behavioral discipline to follow one’s convictions. Out of 100 people, how many would have stayed on the Amazon roller coaster for its entire 20-year ride to enjoy that 49,000% return? Besides founder Jeff Bezos, there are probably few others. Fortunately, it isn’t necessary to find the next Amazon to make money by investing in equities. Instead, one just has to own a market capitalization weighted index fund, which will include a number of potentially loss-making, “grossly overvalued” stocks—like Amazon. Since large company stocks have historically generated an average return before inflation of 10% annually, the goal of every equity investor should be to earn as close to the market return as possible. And the equity market return can be achieved, simply, by owning broadly diversified equity index funds, which lets an investor own a little bit of every one of the leading companies in the world. This is also a bet in favor of humility—of not trying to outperform the market—which history has shown to be a valuable trait. Hindsight bias is a term used in psychology to explain the tendency of people to overestimate their ability to have predicted an outcome that could not possibly have been predicted. Believing that one can predict future results can lead to overconfidence, and overconfidence can lead to fatal investment mistakes such as concentrated bets on individual stocks and trying to time the market.